Puppy Love Caring Canines, Inc. receives many inquiries about assistance dogs and the law. This page of the website should help answer questions about access privileges granted to assistance dogs in public. This is intended as a general overview, not legal advice for any particular situation. For detailed information on Minnesota laws, go to the Minnesota State Legislature website. Federal regulations under the Americans with Disabilities Act (ADA) assures access to public accommodations to persons using service dogs. The Federal Fair Housing Act states that a person using an assistance dog must me allowed access to housing. Two Minnesota laws, statues 256C.02 and 256C.025, prohibit discrimination on the basis of disability in regard to access to public accommodations and housing accommodations by persons using or training service dogs. When you see these dogs in public, please do not pet them without asking permission. Puppy Love Caring Canines, Inc. trains dogs to do several valuable services for disabled individuals. Assistance dogs do not just perform tasks--they also enhance their human partner's lives with a sense of freedom, confidence and independence. We evaluate each client/canine team annually and assists with training if needed. Occasionally there is a need for extra support during a health or financial crisis. Puppy Love will always try to help in these situations. Sizes of breeds are not the most important factors when it comes to assistance dogs. Temperaments and personalities are. We will even evaluate an individual's pet dog to determine if it could be their assistance dog. of skills in order to meet a client's specific needs. Hearing dogs "tell" their partner with hearing loss about important sounds they are missing such as: a smoke alarm, a doorbell, an alarm clock, a crying child and more. These dogs are taught to touch their partner and lead them to the sound. Companion dogs provide therapeutic benefits to individuals. Children or adults with emotional disorders or autism can truly benefit from the unconditional love and companionship that a dog naturally provides. these individuals can gain the confidence to be more engaged in society. People with medical conditions such as epilepsy, diabetes, and certain breathing problems can also greatly benefit from a trained assistance dog. These dogs alert their partner that a medical crisis is coming. This advance notice allows the person to get to a safe place and take needed medication. 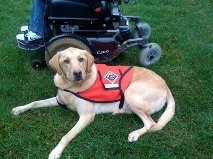 Service dogs are trained to assist a person who uses a wheelchair or has mobility problems. These dogs pick up dropped items, hold doors open, fetch needed items such as a cane, find help if necessary, and do other tasks essential for a disabled person. These dogs are fostered and trained in volunteer's homes for up to two years before being matched with a client.